On The Hunt For Poppies In Mexico — America's Biggest Heroin Supplier : Parallels As the heroin business booms, driven by U.S. demand, Guerrero has been one of Mexico's most violent states. The Mexican army is demonstrating efforts to eradicate the flowering crop at the source. A Mexican soldier piles poppies for incineration near the town of Tlacotepec, in Guerrero state, Mexico. The army says it slashes and burns poppy when fields are too difficult to access by helicopter or when it wants to protect fruits and vegetables growing nearby. The mountains looming ahead are legendary in Mexico. "Whether it was Morelos or Zapata, any figure in Mexican history who needed to escape authorities came here to the mountains of Guerrero," says Lt. Col. Juan Jose Orzua Padilla, the Mexican army spokesman in this region. Today, it's not revolutionaries skulking through this formidable southern section of the Sierra Madre mountains — it's heroin traffickers. Mexico's southwestern Guerrero state is now the top source of heroin for the American drug epidemic, which resulted in more than 64,000 overdose deaths in 2016, mostly from heroin or other opioids. The Drug Enforcement Administration says 93 percent of heroin analyzed by the agency in 2015 came from Mexico, more than double the amount from five years before. The Mexican army gave NPR reporters a firsthand look at its efforts to eradicate poppy — the flowering plant that's a raw material for making heroin. Mexico has the third-largest area under poppy cultivation in the world, after Afghanistan and Myanmar, according to a 2017 United Nations report based on estimates from 2015. By 2016, Mexican poppy cultivation had potentially grown more than three times the national amount estimated in 2013, according to the DEA. "You get up into the mountains and look around the hillsides and there are poppy fields everywhere," says Orzua from an army pickup rumbling over winding dirt roads. Guerrero is a heroin hub not only because its mountains are inaccessible. But also, Orzua explains that the high elevations catching warm, humid air from the Pacific coast are ideal for growing high-quality poppy. The poppy plants — which bloom beautiful, deep-red flowers just before harvest — have changed with agricultural enhancements over the last few years, says Orzua. They are now shorter and each plant can carry up to 10 bulbs from which opium paste is extracted. Harvest time is now as many as three times a year, instead of two previously. Poppy fields are both more productive and more potent in Guerrero. "But this is nothing to be proud of," he adds solemnly. Soon, a few poppy fields spread before the army convoy. The red flowers stick out next to a dead corn field at one end, peach and mango trees at the other. "This is just a distraction field," Orzua says. It's meant to occupy soldiers with destroying less productive fields instead of the best producers, higher up in the mountains. But they're here and have orders to destroy all poppy they come across. A handful of troops begin reconnaissance in the area, tiptoeing among the poppies, rifles at the ready. As the heroin business has boomed, driven by strong demand in the U.S., Guerrero has consistently been one of Mexico's most violent states. The U.S. State Department listed it as a "Do Not Travel" zone in its recent travel advisory. At least 15 cartels operate in these mountains, using brutal tactics to get a slice of trade. But in these fields, the only other person in sight is a farmer up the hill tending to his mango trees. The nearest town is 30 minutes down a winding dirt road. The poppy field has recently been tapped: The bulbs bear horizontal slices made by harvesters. Sticky white liquid seeps out of the incisions. After solidifying and oxidizing for a few hours, it's scraped off. That opium paste then gets trucked by cartels to their hidden mountain labs where it's processed into heroin. The soldiers here — all men in their late teens or early 20s, mostly locals from Guerrero — throw their automatic rifles behind their back and pull out machetes. They hack away at the poppy and pile it into a giant pyre. Fumigation is the top method for the army's poppy elimination. In this little valley, however, the soldiers are killing off the plants by hand, rather than spraying harsh chemicals. Orzua says they don't want to ruin the fruits and vegetables local farmers eat to survive. At the top of the heroin supply chain are largely poor farmers hoping to sell opium paste to cartels. This 2-acre poppy plot could earn a farmer roughly $750 per harvest, half that in a bad year. The best farmers can harvest three times each year. But once it's processed into heroin, its price multiplies and will yield tens of thousands of dollars in the U.S.
"The farmers are the ones who get exploited most. But if they aren't offered a better alternative, they'll just keep returning to poppy," Orzua says. "I'm not justifying it, I just understand their needs." In Guerrero state, where the formaleconomy is shrinking and jobs are disappearing, eradicating poppy was the best legal job going, says Isai Bello, a 22-year-old soldier who recently returned to Mexico from the U.S.
"When I was in South Carolina I could make $80 a day. The army pays about $30 a day but it's the most you can make at a job around here," he says. Bello grew up undocumented in California and Nevada and finished three years of high school there. But when his dad was arrested on drug charges, his mom decided to bring their family back to Mexico. He's now part of this 28-man unit patrolling and eradicating poppy in their 4-square-mile area of the Sierra Madre. As smoke from the destroyed poppies continues to rise, the unit returns to Camp Badillo, their small base on an adjacent ridge, several bright green and red poppy fields visible in the distance. 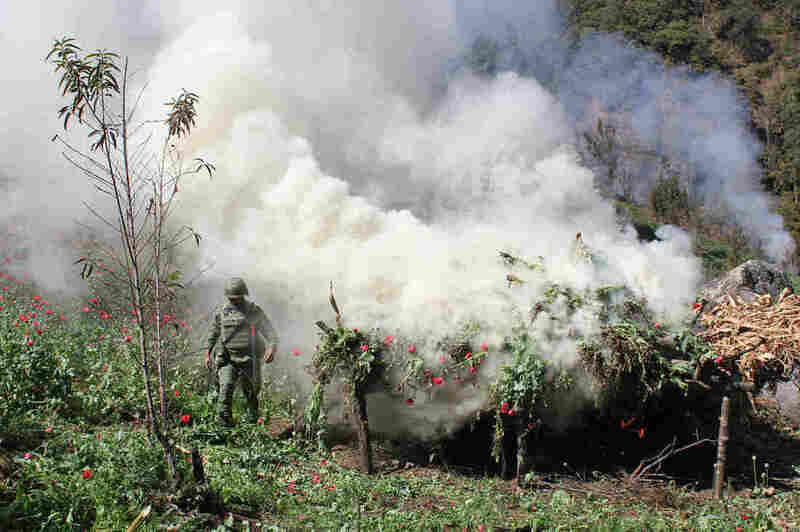 The Mexican army mostly destroys poppy fields via helicopter fumigation with a chemical called Uproquat. But it's difficult in these lush mountains: an army helicopter pilot died in an accident in November. When helicopter fumigation isn't possible, this is how the Mexican army is destroying poppy: small units operating out of rudimentary camps. Hundreds of these units deploy for one to two months at a time, live in tents, cook over a fire, and spend daylight searching for and destroying poppy fields. "We take the toughest and most resilient soldiers because this is a difficult deployment," says 2nd Lt. Pedro Badillo Alvarez, the unit's commander and namesake of his little camp. "We can travel up to 10 kilometers on foot each day and destroy up to 200 plots of poppy each month." 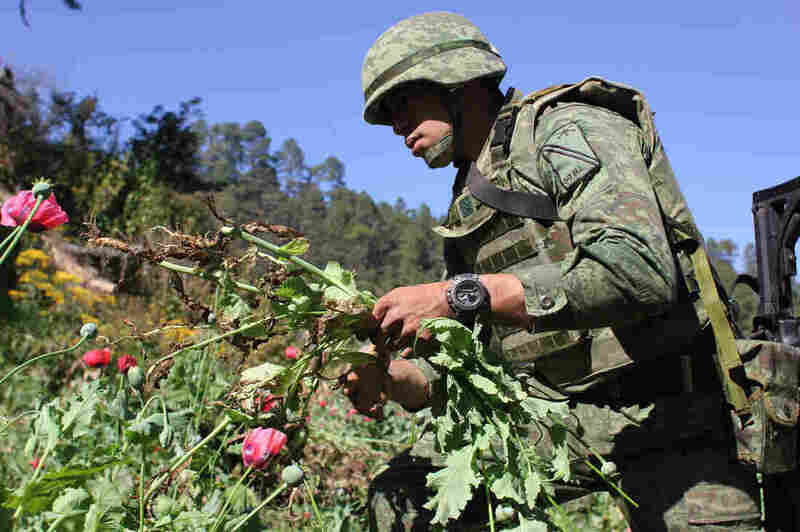 The Mexican army destroyed nearly 200,000 plots of poppy in 2017, up 22 percent from the previous year when the DEA accused the Mexican government of not doing enough to eradicate crops. In the first few weeks of 2018, Lt. Col. Orzua says they're on pace to increase eradication even faster. But as eradication ramps up, there's doubt the effort will make an impact. It hasn't yet. "It is not possible to do a good job [in Guerrero]," says Raul Benitez, a security expert at Mexico's Autonomous National University. "They are failing because of the conditions in the mountains and because drug traffickers totally control the local people and corrupt local politicians." They are failing because of the conditions in the mountains and because drug traffickers totally control the local people and corrupt local politicians. Drug eradication as a concept may not even be sound, says Deborah Bonello, senior investigator for InSight Crime, a nonprofit research group studying organized crime in the Americas. "The whole point of eradication is that it's supposed to bring up the street prices of drugs with supply and demand principles," she says. "But the farmers aren't financed by the cartels. The costs of eradication are absorbed by farmers." If one farmer's field is eradicated, that doesn't necessarily hit the cartels' coffers. The organized crime gangs just buy from another farmer. "If you look at something like Plan Colombia [a U.S.-backed anti-drug trafficking plan launched in 2000], the U.S. government has funded billions and billions into eradication and in 2016 we saw more coca being produced in Colombia than ever before," Bonello adds. "In Mexico, there haven't even been really genuinely successful efforts in terms of offering alternatives [to poppy farming]," Bonello goes on to say. Since 2008, the U.S. has designated $2.5 billion to fund Mexico's fight against organized crime in a plan called the Merida Initiative. While the U.S. has also offered to support and finance Mexican efforts to eradicate poppy, a 2017 U.S. government analysis of the initiative revealed significant gaps. "Drug eradication and alternative development programs have not been a focus of the Merida Initiative even though Mexico is a major producer of opium poppy," reads the report by the nonpartisan Congressional Research Service. It's clear in Mexico and other leading drug-producing countries like Colombia that, without better alternatives, ordinary farmers continually fall into the risky business of selling to narcotrafficking cartels, even as the army crawls through the hills to eradicate crops. "We know eradication is just one piece of the solution," admits Lt Col. Orzua. "We need to all work together in economic development, education, and many other issues to solve the problem of drug trafficking here."